When the problems we refer to as stable vices in horses occur in human beings, we have different names for them. Psychosis, psychiatric morbidity or severe affective disorders. Why do we fail to see the serious nature of the damage we are creating in our horses by keeping them in such an unnatural way? 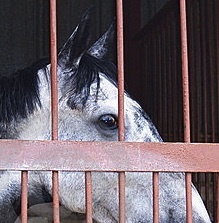 Most horses are not born mentally retarded, although there are a lot of grey areas, and like people, many horses are born with a different 'outlook' or 'make-up'. These are similar to human conditions of autism or hyper-sensitivity. 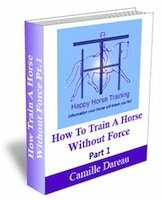 The psychological dispositions horses are born with are, however, a different matter from disorders that result from the circumstances we impose on them. 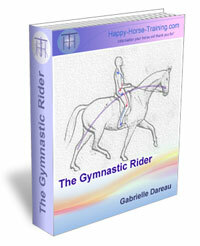 How often are our ways of keeping horses responsible for tipping the balance in their minds? Stable vices are a symptom of this reality. It isn't important to try to define where 'insanity' begins or ends. 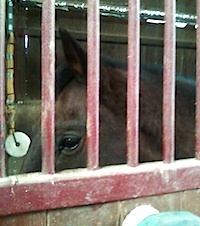 What matters is that we are prepared to look at the truth, because we owe that to our horses. The realization of how profound the psychological effects of confinement on animals are, came to me when I visited the pigs of a neighboring farmer. They were only five or six months old, and they never left the stable they were being fattened in, although it was clean and well-bedded. Having experience of my own pigs behavior, I could see straight away that these ones were mentally retarded. My pigs are on my wavelength, they think and communicate, and when I look into their eyes, I see wisdom and compassion. These pigs were not like that, they looked vacant and stupid. I don't think they started out life like that, they had simply lived for too long without any mental stimulation apart from each other and their food. 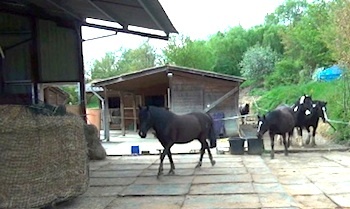 Comparing this to domestic horses, many of them who are kept in permanent isolation do not even have 'each other', and often what they do experience of the world outside their stables is stressful and unfulfilling. I think if most of us had experienced this, even to some small extent, we would be a bit less content to manage horses the way we do when we keep them in solitary confinement for long stretches of time, or even living their entire lives alone. 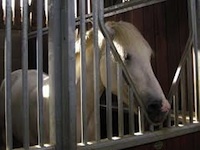 Why are we so immune to the consequences of stabling horses? Most of us would never think of a stabled horse and a human prisoner in solitary confinement as in the same bracket, and we think of stable vices as simply a nuisance. 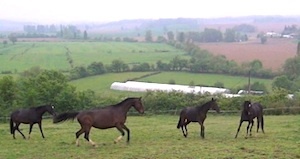 Is our failure to add it up because horses can usually see each other to some extent on a yard, or at least they can see some activity on the yard. It is rarer, but by no means unheard of that horses are shut away out of sight of anything and anyone however. 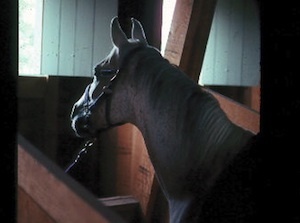 Maybe we are blind to it because most horses react in an introverted way, and their suffering is easier to ignore. 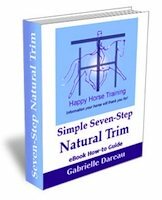 The main problem is that, despite the fact that horses have only been stabled in isolation relatively recently, in evolutionary terms, the tradition has stuck fast, and most people are not aware enough to think about it afresh. 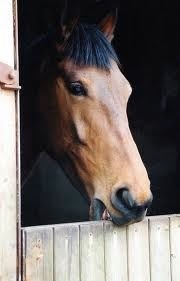 Maybe also, if we were honest, we would probably come to the conclusion that we prefer not to think about the consequences at all, because the other reasons for stabling horses are simply more compelling than examining the problems. The fact that horses are often exceptionally tolerant, in our eyes, only adds to their lack of voice. When you become sensitive to horse language however, you can begin to see how damaging stables are to their essence, their integrity - their 'horse-ness'. It makes a difference to confine them in any way without your presence to redress the balance. The connection with stable vices and the story above (Caged Beasts: The Insanity of Solitary Confinement), is that exposure to solitary confinement for a significant period of the time is bound to result in erratic behavior patterns in any conscious being. Some of these behavior are less visible than others, such as dissociation, and some of them may be more physically harmful to the perpetrator, such as cribbing. What we call stable vices are all just one more step down the road to the loss of sanity, however. If you were drowning in the sea, you would try to hold on to something to keep yourself afloat. These horses are only trying to stop themselves from sinking into oblivion. Weaving - trying to attract attention because of lack of stimulation, loneliness, hunger or pain, and can't. Chewing Wood - trying to graze and browse, but can't. Lip flapping/Head throwing - trying to draw attention to unsupportable levels of anxiety or boredom. Self harm - desperate attempt to create stimulation and/or find an outlet for stress. Horses who have never been confined, never develop stable vices. At Happy Horse Training we might bring our big herd in for a night in the worst weather, and the shelter is appreciated. In the morning however they are mostly impatient to go out. 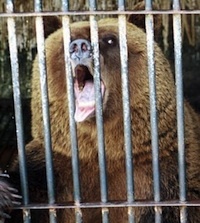 When we can install outside shelter for them, even this much confinement will gladly be a thing of the past. The smaller herd, with their free-access shelter, come and go, and they rarely stay a full night unless the weather is very bad. People might say 'why shouldn't they live at our convenience, we are paying for their food after all', but this attitude is the classic human error we make when we value the concept of convenience more highly than something elusive and beautiful, that we find hard to see and quantify. Then when we have snuffed it out, we don't realize that it was ever there. What is this thing that is of more value than all the convenience in the world? It has been described in many ways because it has a million faces: self will, wildness, joy, freedom, personality, courage and character. It can also be called consciousness and presence. What else can it be but the energy within us which makes us alive? Few of us are immune to the magic of seeing a wild animal in their natural environment - but why? Maybe it is because they are expressing their aliveness as purely as it can be expressed. This is one of the great joys and gifts we can experience when we share our lives with horses - encouraging their 'aliveness' to exist and flourish. When we begin to do this, we see the stark contrast with keeping horses stabled. We start to realize the effects of what we have done, whatever the reason for which we did it. The reasons might be convenience or tradition, but imagining we are protecting them is another common one. When the body has been made soft, fragile and slow, the mind has been twisted and darkened, and the beautiful and ethereal presence of horses has begun to disappear, what is there left for us to protect? It is difficult to erase all the scars, but never too late to give back that open door with the golden light which promises everything good to your horse. Once the choice has been made, in fact, the means become apparent, and then you begin to wonder why you chose to give yourself all that work and hassle, which seemed so convenient, in the first place. Extensive systems of management are rarely more work, when planned and thought out, they are a win-win situation. Even if they were not, who would not want to make some effort to give their horse a world where they can be what horses are: strong, vital and tough. Horses are also intelligent and sensible, and possessed of powers we only touch on most of the time. Stable vices can become a thing of the past, a memory of primitive times when abuse and ignorance went hand in hand. Now is the age for enlightenment and resolution, for opening the stables we have erected in our own minds, and finding our own aliveness once again.